Spot Instances are deeply discounted compute capacity that can provide up to 90% savings over On-demand instances. In other words, for the same budget you get 2-10x times the compute capacity. This is lucrative for enterprises running compute intensive workloads such as video transcoding, big data analytics (Hadoop, Spark processing), log analysis and other batch jobs. However, enterprises have not gotten around to using Amazon Spot instances effectively, though they have been around for over 7 years. RightScale published the “State of the Cloud” report recently and “cost optimization” was one of the key challenges reported by enterprise AWS users. Not so surprisingly, only 14% of the enterprises are looking at using Spot Instances as a cost optimization model. You can run your Big Data/Hadoop Jobs (through Amazon EMR) on spot instances for great savings on large workloads. This however, requires one to bid, manage and monitor the instances (similar to regular spot instances). One best practice is to run the task nodes on spot while running your filesystem (HDFS, Hbase etc) in Master & core nodes on AWS on-demand. Until recently, spot instance would get taken off the moment you got outbid. This gave no time for workloads to perform any evasive action (to store the state or transfer processed information). This changed last year and now you get a 2 minute warning or “Termination Notice” to help you manage your application and take necessary preventive action. Spot Instance limits – Just like many other AWS services, Spot instances also has soft limits (only 20 spot instances to begin with). This can however be changed by submitting a request to AWS. In this post, I will explain how to make the best choice between on-demand and spot in a highly variable Amazon Web Services (AWS) environment. I hope that after reading this you will be in a better position to judge and make decisions based on your use case, scenario, and workload. On-Demand Instances are virtual servers that are purchased at a fixed rate per hour. Each On-Demand Instance is billed from the time it is launched until it is stopped or terminated. Partial instance hours are rounded off to the full hour during billing. Once launched, it will continue to run unless you stop it or in the rare cases of it being Scheduled for Retirement/ Unavailable. These are the most expensive purchasing options. Spot Instances, also virtual servers, are spare computing capacity available at deeply discounted prices. AWS allows users to bid on unused EC2 capacity in a region at any given point and run those instances for as long as their bid exceeds the current Spot Price. The Spot Price changes periodically based on supply and demand, and all users bids that meet or exceed it gain access to the available Spot Instances. These are, by far, the cheapest purchasing option providing savings of up to 90% over On-Demand costs. Google Trends, without any doubt, clarifies that Spot Instances are gaining popularity at a fast pace. But we have been in this space for close to a decade and know for a fact that businesses are still wary to make the shift to Spot Instances. Why is there less adoption? It’s because of a catch. Like all good things, Spot Instances, too, come with a catch: It can be taken away from you at any time! Here’s how it works: You place a bid. As long as your bid price is higher than the current Spot Price, Spot Instances will be available to you. The moment the Spot Price goes higher than your bid price, the instances are taken away from you with a 2-minute warning, known quite aptly as Spot Instance Termination Notice. This gives your applications time to prepare for a graceful shutdown. Most of the existing applications are designed with the assumption that the servers will never go down. It is thus an additional engineering cost and effort to handle this scenario. This involves snapshotting the application and checkpointing data to persistent storage at regular intervals to resume the operation on another server. Due to this, businesses are skeptical to adopt Spot Instances for their use cases. A request for a certain number of instances of a particular instance type is placed. Consider the following example: You run a web-tier application and have a need for 100 m3.large instances. The Spot Price on 04 Oct 2016 at 12:12PM UTC+0530 is 0.0285 USD. What should your bid price be? That question is worth another blog post but say you bid at 0.1 USD. As per Spot availability and your account limits, you will get at most 100 m3.large instances. As you move through the days, you see small Spot Price spikes hovering in the range of 0.08 USD – 0.1 USD. You did good by setting a high bid price! But the real shocker comes on 06 Oct 2016 at 04:57PM UTC+0530. The Spot Price is a massive 1.46 USD. All the 100 m3.large instances are taken away and your web-tier is unreachable. Your application is experiencing an indefinite downtime and you are losing money real quick. The fault, which is apparent in hindsight, was relying only on 1 instance type. You now know that at least 2 instance types must be used in a Spot-only environment to achieve better availability. You request for 50 m3.large and 50 m4.large. You also increase your bid price to 0.2 USD, just to be safe. The unexpected has occurred. At 06 Oct 2016 at 08:27PM UTC+0530, the Spot Price is 0.66 USD. Your bid price is low and both m3.large and m4.large are taken away from you and your application is experiencing downtime again! What did you do wrong? The mistake, again clearly apparent in hindsight, is that both instance types were launched in the same Availability Zone, us-east-1e. You now request for 50 m3.large in us-east-1e and 50 r3.large in us-east-1c. You increase your bid price to 0.3 USD. Again, just to be safe. My God, it happened again! At 06 Oct 2016 at 08:27PM UTC+0530, the Spot Price spiked to 1.7500 USD. All your Spot Instances are taken away and your application is witnessing uncertain downtime again! What went wrong now? Even with these in place, we still saw a downtime. It is a never ending cat-and-mouse game. No matter how safe you think you are, there is always an edge case that causes havoc. It really is an art! Which is a good instance type to launch? Should I launch it in us-east-1a or us-east-1c? Is it ok to launch now or 10 minutes later for better availability? Spot Instances are subject to availability as well as your account limits. Would you rather go for On-Demand or a similar instance on Spot? Spot Fleet is a boon. It vastly simplifies the management of thousands of Spot Instances in one request. You can choose between lowestPrice and diversified as your allocation strategy to meet your requirements. No native support to attach Spot Fleet instances to an ELB. It cannot intelligently decide which instance type to launch if all the Spot Instances are down. Spot Blocks are a good fit for Defined-Duration workloads. Just specify the Block Duration parameter when placing a Spot Instance request. But it is twice as costly as a regular Spot Instance. Why should you go for it? As you can see, Spot Instances management is very complex. There are 50+ instance types, 11 regions, 35+ Availability Zones, and 600+ bidding strategies. It really boils down to, “Do you truly want 100% availability at all times OR 100% availability with a teeny-weeny chance of 99.99% availability sometimes, if at all, at a cool savings of up to 90%?” Think about it: The worst case is around 10 minutes downtime in a year and if your annual On-Demand expenditure is 1M USD, then you get the same performance and functionality and similar uptime with savings of up to 900,000 USD. I know you have one final question that still has you scratching your head: “Can I get the best of both worlds?” Yes you can! We also offer a hybrid model of On-Demand and Spot Instances for 100% availability for the really mission-critical workloads. Vijay Olety is a Technical Architect at 47Line. Fondly known as “Garage Phase Developer”, he is passionate about Cloud, Big Data and Search. He holds an M.Tech in Computer Science from IIIT-B. In Part 6, we discussed handling failures via Hinted Handoff & Replica Synchronization. We also talked about the advantages of using a Sloppy Quorum and Merkle Trees. In this last & final part of the series, we will look into Membership and Failure Detection. In any production environment, node outages are often transient. But it rarely signifies permanent failure and hence there is no need for repair or rebalancing the partition. On the other hand, manual errors might result in unintentional startup of new DynamoDB nodes. A proper mechanism is essential for the addition and removal of nodes from the DynamoDB Ring. An administrator uses a tool to issue a membership change command to either add / remove a node. The node that picks up this request writes into its persistent store the membership change request and the timestamp. A gossip-based protocol transfers the membership changes and maintains a consistent view of membership across all nodes. Each node contacts a peer chosen at random every second and the two nodes efficiently reconcile their persisted membership change histories. Partitioning & placement information also propagates via the gossip-based protocol and each storage node is aware of the token ranges its peers are responsible for. This allows each node to forward a key’s read/write operations to the right set of nodes directly. It’s best to explain with an example: An administrator joins node A to the ring. He then joins node B to the ring. Nodes A and B consider itself as part of the ring, yet neither would be immediately aware of each other. To prevent these logical partitions, DynamoDB introduced the concept of seed nodes. Seed nodes are fully functional nodes that are discovered via an external mechanism (static configuration or a configuration service) and are known to all nodes. Since each node communicates with the seed node and gossip-based protocol transfer the membership changes, logical partitions are highly unlikely. Failure detection in DynamoDB is used to avoid attempts to communicate with unreachable peers during get() and put() operations and when transferring partitions and hinted replicas. For the purpose of avoiding failed attempts at communication, a purely local notion of failure detection is entirely sufficient: node A may consider node B failed if node B does not respond to node A’s messages (even if B is responsive to node C‘s messages). In the presence of a steady rate of client requests generating inter-node communication in the DynamoDB ring, a node A quickly discovers that a node B is unresponsive when B fails to respond to a message; Node A then uses alternate nodes to service requests that map to B‘s partitions; A also periodically retries B to check for the latter’s recovery. In the absence of client requests to drive traffic between two nodes, neither node really needs to know whether the other is reachable and responsive. This exhaustive 7-part series detailing every component is sufficient to understand the design and architecture of any NoSQL system. Phew! What an incredible journey it has been these couple of months delving into the internals of DynamoDB. Having patiently read this far, you are amongst the chosen few who have this sort of deep NoSQL knowledge. You can be extremely proud of yourself! Let’s eagerly await another expedition soon! In Part 5, we spoke about data versioning, the 2 reconciliation strategies and how vector clocks are used for the same. In this article, we will talk about Handling Failures. 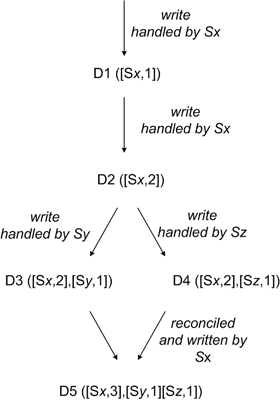 Consider the above figure: If A is temporarily not reachable during a WRITE operation, then the replica that would have lived on A will be sent to D to maintain the desired availability and durability guarantees. The replica sent to D will have a hint in its metadata which tells who the intended recipient was (in our case, it is A). The hinted replicas are stored in a separate local database which is scanned periodically to detect if A has recovered. Upon detection, D will send the replica to A and may delete the object from its local store without decreasing the total number of replicas. Using hinted handoff, DynamoDB ensures that READ and WRITE are successful even during temporary node or network failures. Highly available storage systems must handle failures of an entire data center. DynamoDB is configured such that each object is replicated across data centers. In terms of implementation detail, the preference list of a key is constructed such that the storage nodes are spread across multiple data centers and these centers are connected via high speed network links. According to Wikipedia, a “Merkle tree is a tree in which every non-leaf node is labelled with the hash of the labels of its children nodes.”. Parent nodes higher in the tree are hashes of their respective children. The principal advantage of a Merkle tree is that each branch of the tree can be checked independently without requiring nodes to download the entire tree or the entire data set. Moreover, Merkle trees help in reducing the amount of data that needs to be transferred while checking for inconsistencies among replicas. For instance, if the hash values of the root of two trees are equal, then the values of the leaf nodes in the tree are equal and the nodes require no synchronization. If not, it implies that the values of some replicas are different. 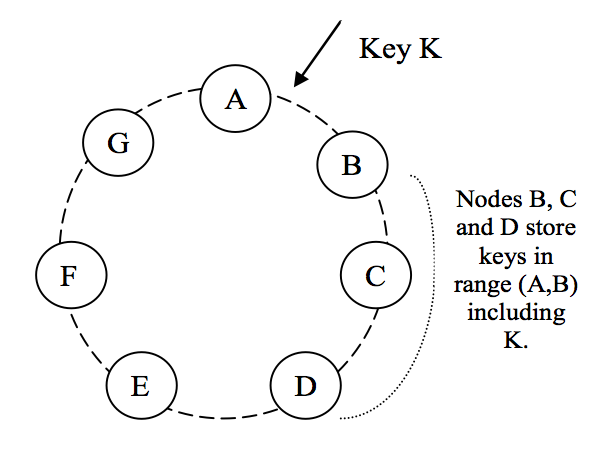 In such cases, the nodes may exchange the hash values of children and the process continues until it reaches the leaves of the trees, at which point the hosts can identify the keys that are “out of sync”. In Part 4, we talked about partitioning and replication in detail. 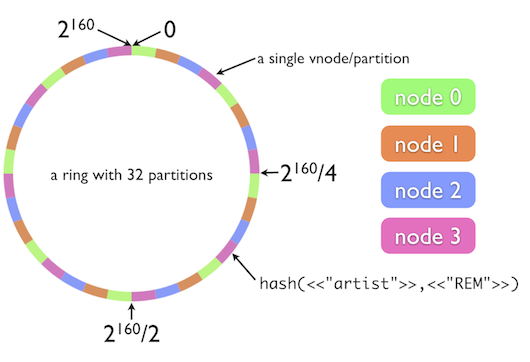 We introduced consistent hashing, virtual nodes and the concept of coordinator nodes and preference list. In this article, we will discuss Data Versioning. Eventual consistency, introduced by DynamoDB, allows for the updates to be pushed to all storage nodes asynchronously. A put operation returns before the update is pushed to all replicas, which results in scenarios where a subsequent get operation may return a value that does not reflect the latest changes. Depending on network partitions and server outages, not all replicas might have the latest updates even after an extended period of time. But there are certain requirements that do not need latest updates and can still tolerate certain inconsistencies. One such requirement is “Add To Cart” where put operation should always succeed and a get operation returning an old object is still tolerable. If a user makes a change to an earlier version of the shopping cart object, that change is still meaningful and should be preserved at all costs. However, the currently unavailable latest state of the shopping cart can have its own version of updates which should also be preserved. It is evident that data versioning has to be implemented to handle such scenarios. In order to achieve such guarantees, DynamoDB treats the result of every modification as a new and immutable version of data. This allows for multiple versions of an object to be present in the system at the same time. If the newer version subsumes the earlier one, then the system can automatically determine the authoritative version (syntactic reconciliation). However, in some cases the versions conflict and the client has to manually perform the reconciliation (semantic reconciliation). DynamoDB uses vector clocks in order to capture causality between multiple versions of an object. A vector clock is a list of (node, counter) pairs. One vector clock is associated with one version of every object. By analyzing the vector clocks, you can find out if the versions have a causal ordering or are on parallel branches. When a client wishes to perform an update, it must specify which version it is updating. This version can be got from an earlier get operation. Let’s understand how vector clocks works: A client writes a new object. Node Sx handles this write and creates a vector clock [(Sx, 1)] for the object D1. If the client now updates the object and node Sx again handles the request, we get a new object D2 and its vector clock [(Sx, 2)]. The client updates the object again and this time node Sy handles the request leading to object D3 with the vector clock [(Sx, 2), (Sy, 1)]. When a different client tries to update the object after reading D2, the new vector clock entry for object D4 is [(Sx, 2), (Sz, 1)] where Sz is the node that handled the request. Now when a new write request is issued by the client, it sees that there are already D3 and D4 objects. 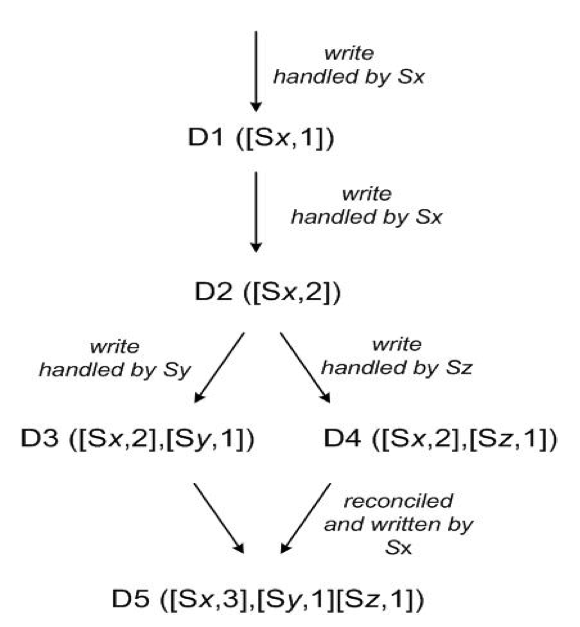 If node Sx is handling the request, it performs the reconciliation process and the new data object D5 is created with the vector clock [(Sx, 3), (Sy, 1), (Sz, 1)]. One possible issue with vector clocks is that its size may grow rapidly if multiple servers coordinate the writes to a particular object. However, this issue is unlikely since in production only the nodes from the preference list handle the operation. It is still desirable to limit the size of vector clock. DynamoDB implements the following clock truncation scheme: A timestamp, which indicates the last time that node updated an item, is stored along with (node, counter) pair. When the number of (mode, counter) pairs reaches a threshold (say 15), the oldest pair is removed from the clock. In the next article, we will look into how to Handle Failures.